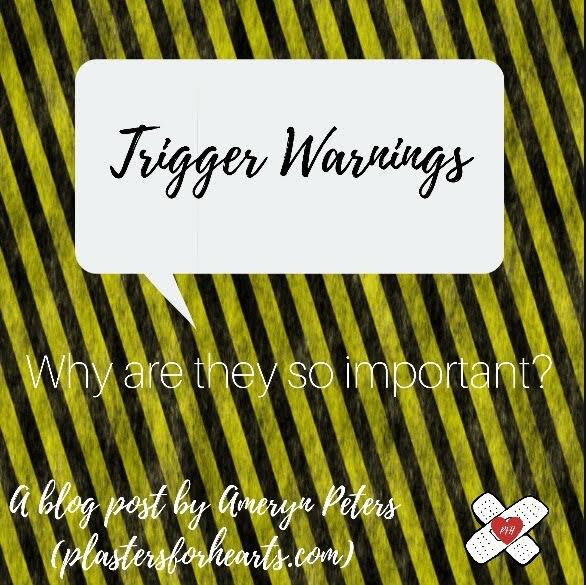 Our world has many, many problems and I'm sure this one is far from the top of the list but it's one that lies close to my heart: Trigger warnings. Trigger warnings are so freaking important! Let me tell you why. There are a lot of people in this world who seem to be infinitely happy and lead great lives but who may be struggling with depression, possibly self harm. One of these people could be your friend. You would obviously never know this,unless they told you. But one day that person whom you love so dearly is having a bad day. They click on a youtube video titled "I am depressed" and the person in the video proceeds to talk about their experiences with cutting, depression, suicidal thoughts. And your friend gets triggered. They think about all the times they've cut and how good it felt. And they decide "what the hell, one more time won't hurt". And they reach for that knife. The person making that video didn't bother to put a trigger warning before the video started. They didn't think about how what they were saying could affect other people. And because of that, something bad happened to someone else. This example could have been worse. Much worse. A specific incident made me angry and even more passionate about this subject. I'm going to tell you about it: At my highschool a few years ago, the grade nine art girls were given an art prac in which they had to make art about an issue they feel strongly about and put it up around the school. What a beautiful way to encourage creativity and spark interesting conversations, right? Well, yes. But unfortunately many girls decided to put up art about suicide with things like nooses and tombstones saying "What's more difficult, accepting your child for who they are or burying them because you couldn't?". They had hotline numbers people could phone for help and inspiring quotes. Those pieces of art were soon taken down. This made lots of the grade nine girls angry because they felt that their art was being devalued for speaking out about suicide and they felt that the school was trying to 'sugar coat' the world for us. But THAT WASN'T THE PROBLEM. Let me explain what the problem was for those of you who don't understand. I'd like to start off by saying that I completely advocate for spreading awareness about suicide and all mental illnesses (OBVIOUSLY), BUT what people fail to realize is that people at school may be dealing with suicidal thoughts/tendencies. Just seeing the word "suicide" could be triggering. It's all very good and well for you to be pro spreading suicide awareness but if you aren't directly affected by it you wouldn't understand that even the slightest mention of suicide could be triggering and lead to dire consequences. I think that discussions around mental illness, specifically suicide, should be facilitated in a safe and healthy manner because no one knows the impact it could have on someone to see this kind of art. People should have a CHOICE if they want to see it. You can't shove it in someone's face as they're turning the corridor at school BAM HERE'S A REMINDER THAT SUICIDE EXISTS AND IS A THING BYE NOTHING MORE SAID ABOUT THE MATTER NOR IS A HEALTHY CONVERSATION BEING STARTED. I mean if you are a suicidal person and you turn a corner and see the word 'suicide' just in your face, it could have massive implications, REGARDLESS of its good intentions. Suicidal people don't WANT to be helped. Take it from me. I know! A person like that has such an incredibly unstable mental state that they could take art like that dramatically out of proportion. I know that many girls at school were triggered which is the main reason they took it down, and I absolutely commend them for that. And it's not just suicide, but depression too. Someone told me "They were amazing [the art, obviously] but I instantly felt like I had done something wrong or it was all my fault when I saw them, just because they were saying "NO" to depression and well...I'm depressed." I think that that's such a good example of the impact this art can have. I for one wasn't at school while these art works were up because I was sick in bed with the flu and I'm really glad I wasn't because I know for a fact that I would have been triggered and it makes me so mad thinking about the fact that such a stupid mistake could have undone all the work I had done on my mental health over the past few months. In conclusion, while art like that is wonderful, we should allow people to choose whether or not they want to see it, for their own mental health stability and safety. I apologize if this post sounded aggressive in any way, I am just very passionate about this subject and I'm so glad I finally got to write about it! I hope this was helpful and insightful maybe? I hope you learned something too! Please let me know what you thought! Feel free to continue the conversation by following me on twitter (@amerynpeters), instagram (@plastersforhearts) or pinterest(@plastersforhearts)!